Since I cut the cord some time ago I have been using a couple generation 1 Simple.TV DVRs to record over-the-air (OTA) television broadcasts in my local area. I found them on Woot with a lifetime subscription at a really low price. They are not the most polished devices, but are very functional. I have heard the generation 2 Simple.TV DVRs, which they sell now, are better. I like the ability to record shows and stream them to any device I want, anywhere I have a good network connection. (I recently watched part of the NFL playoffs at a local gym streamed from the Simple.TV at my house.) I also enjoy having the option of skipping the monthly bill ride and instead paying a one time lifetime subscription. Recently, Simple.TV performed some maintenance on their infrastructure which, for what appeared to be a lot of their customers (to include me), resulted in a catastrophic loss of all recorded shows, reset of the devices, and re-registration. Imagine how one would feel if they completely lost all their information stored in their cell phone with no way to recover it. Many customers of Simple.TV (again, to include me) were not happy. The fault at Simple.TV sent me back out to see what OTA DVRs the market now offers for the cord-cutter enthusiast. During that search I found Tablo. I pulled up the reviews and watched several videos about the product, both by Tablo and users. I even found reviews from Simple.TV users who made the switch and could well compare the two products. Additionally, I found a couple of very good total cost of ownership (TCO) charts that the Tablo staff put together, one of which I have included below. 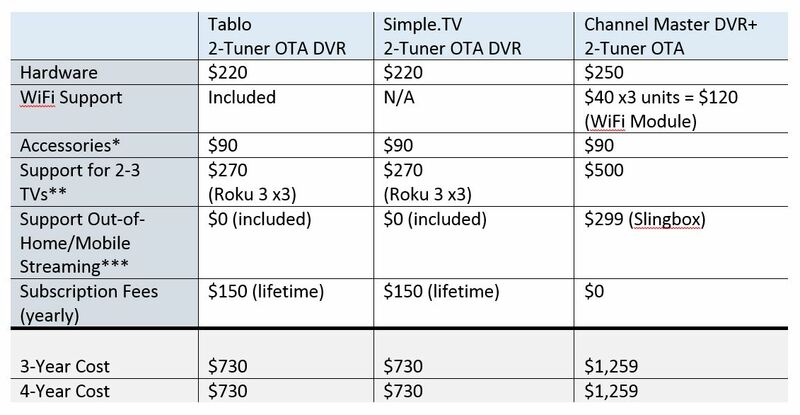 While I must admit up front that I am not going to switch out my Simple.TV DVRs, yet, it was tempting to think about doing so. Reliability is a strong selling point for me. If I had to find a good OTA DVR now, I would strongly recommend looking at Tablo.